Contact Women and Children’s First, a bookstore in Chicago. To receive a signed and/or personalized copy, you *must* note that you want a signed or personalized copy in the Comments box at checkout. Please allow an additional two weeks’ time to allow for Crystal’s schedule (when she can stop in and sign). “What does a runaway cheetah, a John Lennon poster, a girl named George, a pair of jeans riddled with question marks and Jello have in common? 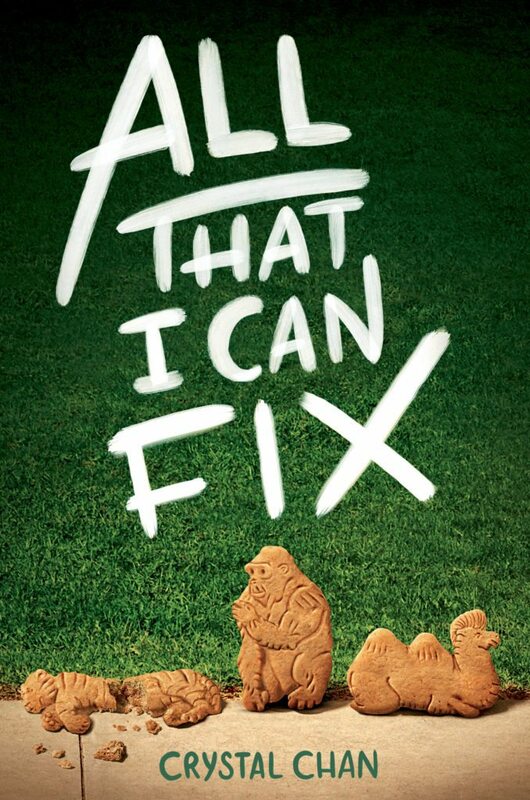 Crystal Chan’s life-affirming new novel, All That I Can Fix.” – G. Neri, Coretta Scott King honor-winning author of Yummy and Ghetto Cowboy. of humor about reality and relationships. Chan takes a measured approach to controversial topics like suicide and addiction, the news media, gun control and rights, and animal activism, most of which are relevant to today’s teens. At a time when high-school students are campaigning for change, this book is sure to be in demand. A strong choice for YA collections, this complex selection with a variety of relatable characters in extraordinary circumstances will win over teens.